Is New South Wales getting a fast rail?! Ever been infuriated by the fact that it takes the same amount of time to get from Sydney to Newcastle as it does to get from London to Paris? Well, prepare to find something else to stew over because Australia may soon be joining the ranks of Europe and Japan, where you can travel thousands of kilometres in just a few hours. The New South Wales government has proposed a new Fast Rail Network Strategy which could see a four-hour train trip to Canberra cut down to just one hour. 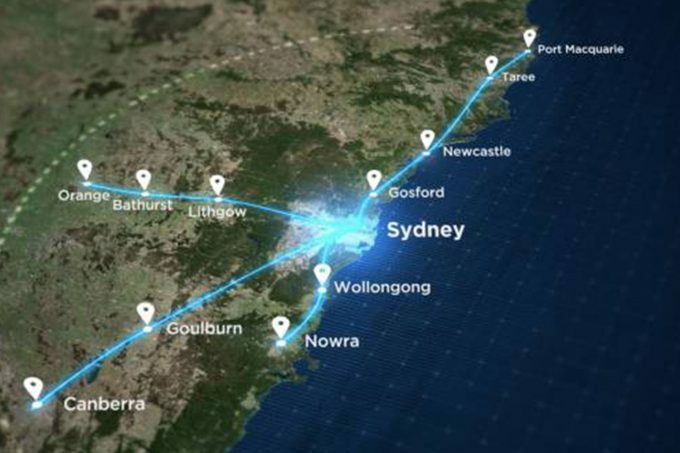 The proposed routes would also see passengers travelling from Sydney to Newcastle in 45 minutes, or to Wollongong in just 30 minutes! According to AWOL, the new high-speed trains would need to operate 75 per cent faster than the current NSW trains, meaning they’d hit about 250 kilometres per hour. Not so bad, considering Japan’s Shinkansen trains go about 320 kilometres per hour. But, for the plans to go ahead, NSW Premier Gladys Berejiklian and her party would have to be reelected next year and existing rail links would have to be upgraded before the swanky new trains can go ahead. Let’s just hope it doesn’t face as many setbacks as Sydney’s light rail. Thousands of km in just a few hours? By Trina? That’s just not possible anywhere. Big news if you’re a regional city or an aspiring pilot. We’re so hungover this morning you honestly could have told us we were either and we would have believed you. New research shows that Victoria is now the state most Aussies intend to visit. Ok, Melbourne, you win this round. We scrolled back through our Instagram and discovered the most popular posts for us are our dogs. Well, not our dogs. Other people’s dogs.